Yesterday we made a quick trip to a little stand where we could pick out huge pumpkins for super cheap. Several neighbors had recommended the place, and I’m so glad they did. It was the perfect place to let the kids pick out great pumpkins without it costing us an arm and a leg with cow trains, hayrides, snacks and mazes! My boys each picked huge pumpkins that would be plenty big for carving their chosen designs and they only cost $4 each! Before we even left, my boys were already talking about how they wanted me to make roasted pumpkin seeds with the seeds from their pumpkins! My oldest was super excited to carve his pumpkin with a Star Wars design. Last year, after Halloween, I picked up a Star Wars Pumpkin Carving Kit and he couldn’t wait to use it. Hubby said the tools in it were really helpful and the designs were great. The designs are pretty complicated, so probably best suited for teens or if parents are planning to help out a lot. My 9 year-old was able to help with it quite a bit, but definitely couldn’t have done it alone. I’m sure my boys will be doing designs from the book for several more years. I’ll have to add a pic of the finished product with a candle inside later! I know there are recipes all over the internet for roasting pumpkin seeds, but I wanted to post mine just so I can always have it to refer back to! We really liked the seasoning on these better than any we’d had before. Our family loves garlic salt, but if your family doesn’t, you can definitely just use regular salt. These are a healthy, nutritious snack that I can feel good about everyone snacking on! This recipe below is based on 1 cup of pumpkin seeds. Just multiply it for however many cups of seeds you have. Line a baking sheet or jelly roll pan with aluminum foil (this makes for easy clean-up). Spray foil lightly with cooking spray. In a Ziploc bag, put the oil and pumpkin seeds. Seal and use your hands to squish the seeds around to coat them completely with the oil. Open the bag and add the garlic salt. Seal the bag and use your hands to squish the seeds around to coat them with the garlic salt. Open the bag and pour out the seeds onto baking pan. Gently spread them out in a mostly single layer. Bake at 325° for 10 minutes. Use a spatula to turn/mix. Return to oven for 10 minutes. Use a spatula to turn/mix again. Return to oven for 5-10 minutes, watching closely, until done. You can eat a slightly cooled seed to make sure you don't overbake them. Total baking time is 25-35 minutes. I baked mine for 32 minutes, but wish I'd pulled them out just a couple minutes sooner this time. Baking time will vary if making a huge batch or if your seeds are very large. I love your photo! So cute! We roasted some delicata squash seeds last week and found they were just as good as the pumpkin seeds we remember making as kids, which is great because (unfortunately) I’m not sure I see any jack-o-lantern carving in our near future. Well, now I don’t think we will since none of the stores are selling pumpkins anymore! We blew all our creative energy on our piñata this year. 🙂 Next year! 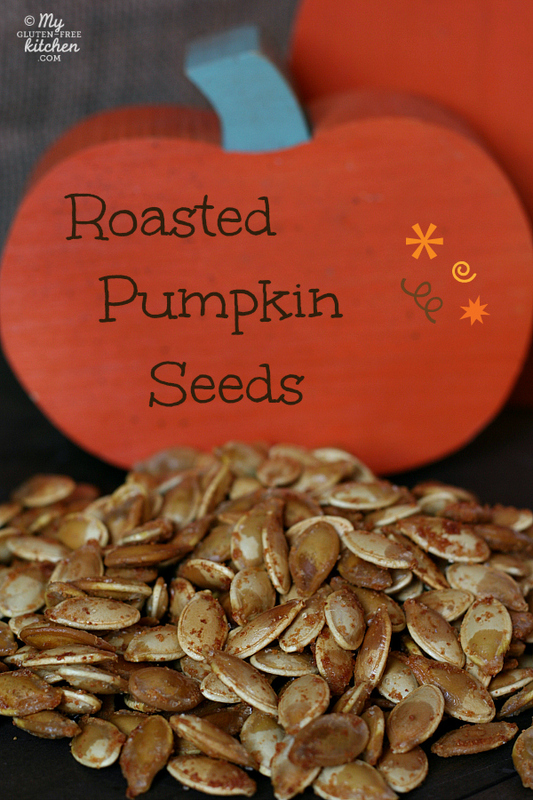 Great recipe for any pumpkin seed lover!!! They turned out AMAZING…first try:) I used parchment paper (I have an obsession:) instead of aluminum foil, but that is the ONLY thing I did different. Parchment paper is almost always a good choice! Good to know it worked here. I use it a ton as well! Thanks for the comment and rating Brooke! I saw this when I came for your lemon chicken recipe just minutes after I cut up a pumpkin (my kids have been asking for pumpkin pie ever since I bought a pie pumpkin from the farmers market). This will make a great mid-morning snack for my family, yum!